Rating: 85 percent based on 824 votes. 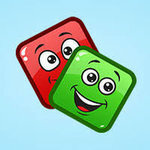 Description: Gummy Blocks is a free HTML5 Puzzle game where you need to try and place blocks around the map to try and fill up rows of blocks to remove them from the map. Try and get the highest score possible.